A while back I was knee-deep in my crochet obsession when I came across the most awesome free pattern I have ever found! It was for the most adorable little horse purses. With three little girls embedded with an ingrained love of anything to do with horses, I knew this was going to be a win win for everyone. What's not to love about these faces? The lovability of a stuffed animal with the convenience of a carrying bag. Nice. Here is a shot of the inside "storage" area for all of your little girl's worldly treasures. Each daughter was able to customize the colors they wanted. My oldest wanted a unicorn, so that was a little trickier. I had to sort of wing the "horn" part by crocheting a little triangle tube and attached it between the eyes. The rest followed the regular pattern. My littlest wanted one to look like a "real" horse and she named hers "Apples" by the way. My middle child is who inspired this project as I started out making her one as a surprise for her birthday. I went with the colors of the original pattern found here: Horse purse pattern. What girl wouldn't want a pink and purple pony purse? 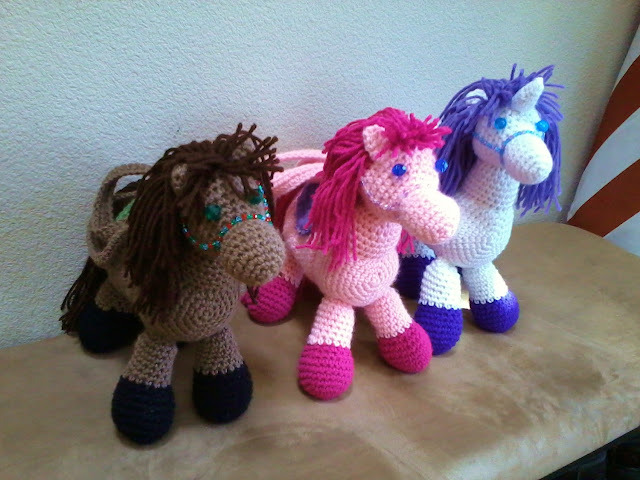 Here are some pattern tips: When I made the pink and the white horses, I used Caron 1-pound yarn (found at Joann's). This yarn comes in many colors and seems a tad thicker than the red heart super saver yarn. Both of those horses stood up better on their own and felt a bit more firm. For the he brown horse I used regular red heart yarn and it's just a tad more floppy than the other two. 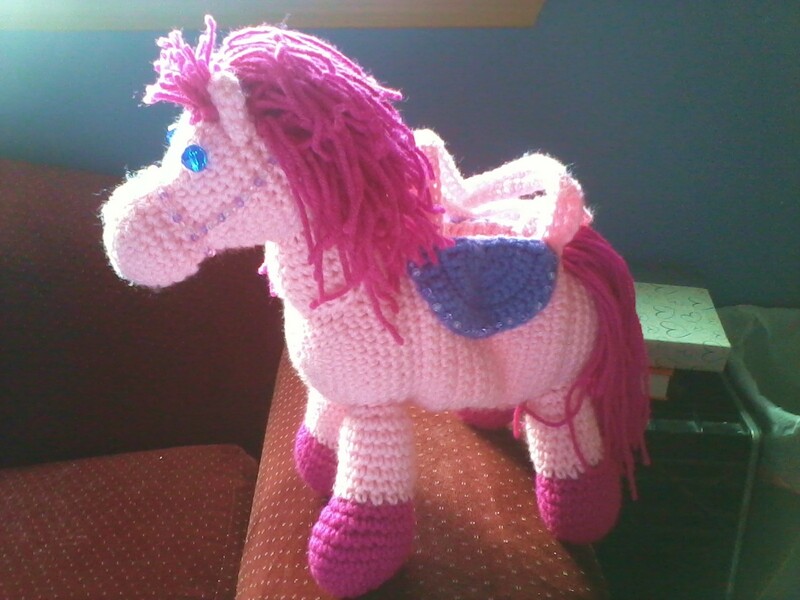 Also for the mane and tails I used red heart yarn. The directions are very clear and it took a little bit of trial and error to attach all the parts (ears, legs, saddle, handles) correctly and to make then look nice. The mane technique was new to me and it reminded me of latch hook from my childhood. I did opt to add the embellishments of a beaded bridle and beads for the eyes. I used embroidery thread and bought a multicolored assorted box of beads at Walmart for about $9 to get those tiny little bridle beads and then those bigger ones for the eyes. Here is a close up of the saddles, as I decided to embellish these with matching beads as well. This project took me about three days. One day to make all the parts, one day to attach them together and stuff them, and an extra day to attach the mane and tail and to do the fancy bead work. These were not all day things, just worked on them a bit each day. With the tiny beads these might not be safe for kids under three, but would be perfect for anyone over 4 years old. I just love these cut little horse purses! I just love how these turned out. 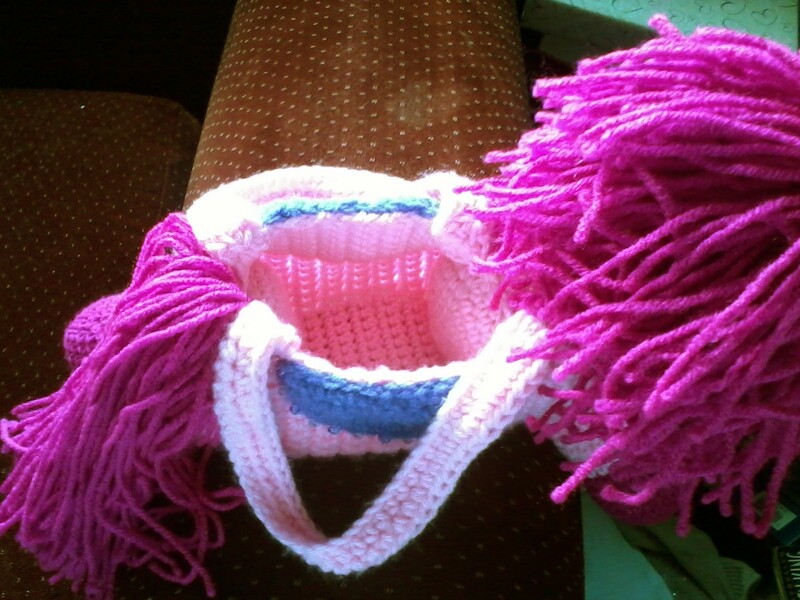 You can customize this for any little girl with her favorite colors. Great as a personalized birthday gift or make them for all the girls in your family for Christmas.